Affinity maturation is the process by which antibodies increased its affinity, avidity and activity through multiple rounds of somatic hyper mutation (SHM) in germinal centers. 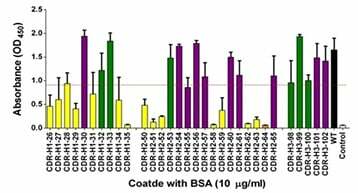 Successive generations of B cells mutate and present to the antigen, that recognize the antigen with high affinity will survive and the low affinity ones are eliminated. Affinity maturation process more often applied to antibody leads that are selected from library approaches using a phage display technique and the affinity of the leads have 10 –100 nM affinity levels to the target. In antibody drug discovery, affinity maturation is applied to antibody leads to increase the affinity at least 10 to 50 folds. GenScript conduct affinity maturation according to the parent antibody sequence that client provided through FASEBA screening to increase the antibody affinity to target antigen at least 5 fold and it can go up to 100 folds. Our FASEBA (FASEBA (Fast Screening for Expression, Biophysical-properties and Affinity) is a patented E.Coli based system that selects good affinity, expression level and thermostable candidates. Affinity maturation turnaround time for this process would be 4 to 5 months. 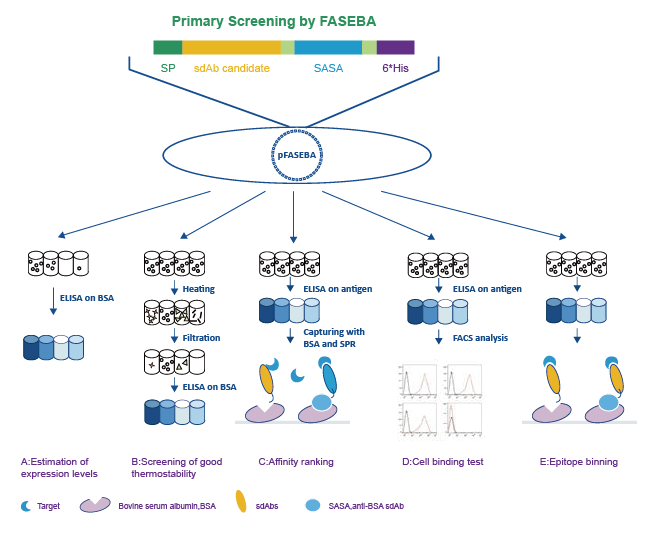 FASEBA technology is used to select the best protein binders from a large number of protein candidates in a high throughput fashion, without actually purifying these proteins. FASEBA selection is based on the expression level, biophysical properties, Binding affinity, cell binding, and functional activity of protein candidates. GenScript's proprietary paratope mapping technology, key residues affecting expression shown in (A) and binding shown in (B) of an antibody, that can be quickly and accurately Identified. Case studies shown here are only for heavy chains. Affinity maturation performed using FASEBA library construction and screening methods to wild-type and positive test binder AS04498. AS04498 affinity is 38 fold increased compare to wild-type IgG and the affinity interval is shorter compare to As04498.